Today was to be the Adelaide Christmas Pageant, but with a forecast max of 39°C yet again ‘they’ were not expecting the crowds to be out in force. We decided, without much thought needed, that even a reduced crowd was too many for us and that we would go and check out The Parade at Norwood. I’d forgotten it existed but as I’d glanced over a suburb map to see what to do for the day my little eyes lit up with joy. This was a place I’d been asked for many, many times at directories so I was now eager to see what it was like. We walked to Currie Street to catch the bus to Norwood but the road was closed off because of the pageant route. Fair enough, but where to from here? There were 2 parked buses the other side of the cones along with a couple of supervisors wearing ‘hi vis vests’. Trust me, we know a bus supervisor when we see one! So we went and asked where to catch the bus and were told to go to Light Square. It was 39°C on the asphalt in the city so off we walked with my sore feet the half a kilometre to Light Square and found another bus supervisor. Guess what? This one told us we had to walk ‘just literally around the corner and you’ll find the bus’. But when we walked ‘literally around the corner’ the 2 buses there were not moving either. Yet another supervisor told us these were only reserve buses and we had to walk to Grenfell Street! Too many chiefs and not enough indians me thinks – stop supervising and get driving fellas! But all were friendly so we forgive them. Grenfell Street, and a bus stop with the right number on it at last. And along came a bus after about 5 minutes and we gratefully boarded and sat in the shade of its roof. By this time the cones for the cordoned off pageant route were mostly removed and we could have stayed where we’d started out and caught the bus from there! The next thing we know is that our bus is making a U-turn because there were fences across the road and a horse, complete with rider, trotting across the middle of it! The road was closed because of an equestrian event! It was all happening in Adelaide. We watched carefully where we were going and saw for ourselves where to get off once we’d turned onto Norwood Parade. It was just a street with shops along it but very nice. In all honesty, the bus trip had been shorter than the distance we’d walked to catch the jolly bus in the first place! Can’t win ‘em all. But it was thankfully the same direction as we’d travelled already, not doubling back on our weary footsteps. The first shop we saw was a Baskin Robbins and David asked if I’d like an ice cream and it didn’t take me long to answer ‘yes please!’ It’s funny how we eat ice cream while on holidays as we never touch it at home. We had a nice little explore along the road, just window shopping and looking around, but eventually saw some crocks shoes outside a sport shop and I decided to try on a pair. Everyone I know who has these rave about how comfortable they are and I really needed some comfy shoes! I bought a pair and we continued our exploring but not for long as David had only bought 2 hour bus tickets so we had to get on the bus back to the city. And, just for a change, went to Woolies in Rundle Mall to buy something for a late lunch. We’d looked for something to bring back with us in Norwood but because we were hurrying for the bus did not find anything mutually agreeable. We also needed to buy a black marker pen and some labels for our cases ready for the boat – we had to label our cases with our cabin number. The rest of our shopping list, composed by David in honour of my feet was ‘corn pads, back brace, stretcher and possible wheelchair!’ After Woolies we found the tram stop to be overly busy so walked the rest of the way back to the hotel. By which time my crocks had given me a new blister! I decided that now was the time to do my belly dance for David. (The tradition of a holiday bellydance performance had started in Fiji in April ’09 and has continued since.) It was supposed to have been for on the boat (his birthday) but we had no idea if there would be room in our cabin. I’d had a quick practice in the bathroom of the hotel the day before and I really couldn’t do what needed doing in that tiny space so thought it best to dance now in case the cabin was as cramped. David prepared the music while I got changed and then the dance went so well that I did a second one for him as well. I did the one I’d choreographed myself first and then the one to a Shakira song that we’ve been learning in class. It was fun and I was only the teensiest bit nervous/self-conscious whereas the last time I’d been really a lot of both! He liked it and that’s the main thing. Then we watched Tiger Woods again to see how he was going, and I took a nap until it was time to think about dinner. This time from my list we chose ‘Mapo Korean’, and off we walked to Gouger Street. The girl that greeted us was very nice but looked doubtful as to whether they could accommodate us unless we could eat and be gone in an hour. Everyone that’s ever eaten with me will know that this would be impossible, but then a guy came and said that it was no trouble and came and found a table for us. The restaurant was nicely decorated in black, white and red and the table had cloth napkins and silver chopsticks with an array of glasses. We had never eaten Korean before but enjoyed looking through the menu and chose an entrée and main course each, but all to share. The entrees were amazing and delicious, though David had me in stitches with his chopstick antics – deliberately done – he loves to make people laugh! In the end he beckoned the waitress and said “Please could I have a knife and fork as these must be the most useless implements known to man!” She and I both laughed. David’s choice of main was really nice but mine had a problem and didn’t ‘feel right’. Eventually I realised it was just really fatty and of course I don’t usually eat much fat – if any! We were sharing anyway so we cleared all of David’s but barely ate half of mine. However, would we eat Korean again? Yes, definitely! We did not have dessert. This restaurant, as perhaps indicated by the cloth napkins and silver looking chopsticks, was yet another that was not cheap. But all had been really nice and I would happily go to any of them again. We walked back home and watched ‘The Body Guard’ on TV before bed. After our usual breakfast we decided to wander up beside the river to the museum. We admired the mummy ducks and babies along the way – so adorable! I’d fancied visiting the museum all along but David had not, however, we really had run out of things to do so he said OK. It was 40°C this day so the museum allowed us to take water bottles in with us – they don’t usually. We had to check David’s backpack in with security before we were allowed in. I was very conscious that this activity was not something David was enjoying so we pretty much skimmed around, which was good in some ways or I’d have read everything in sight and got kicked out at closing time. The Aboriginal displays were fairly boring very quickly, though there were a lot of things from Fiji and areas like that which were more interesting – perhaps because these were new to us, perhaps because they were smaller displays. And then we found ourselves back at the beginning. Hey, hang on! Where are the rocks? These were what I’d gone for! We had to look closely at the map to figure out how to find the rocks, but we got there and David allowed me to slow down and drool my way around all of the displays here. 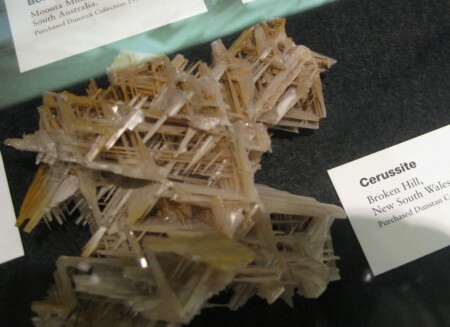 This is Cerussite – isn’t it amazing? 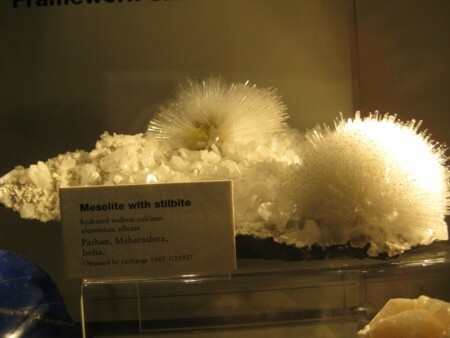 And below some ‘Mesolite with stilbite’. No matter the name, it’s so pretty! After finally dragging me away from the rocks we went into the shop. David didn’t want to shop but I won 🙂 Anyway, amongst everything we found some gorgeous fluffy monkeys that made quite an authentic sound when you pressed their tummies and couldn’t resist, so bought one each for Jamie and Andrew. It’s such fun having grandchildren so you can have an excuse to buy these cute things! We decided to have lunch here in the air-conditioning and were really surprised at the menu. Expecting soggy pies or dried up sandwiches as our choices we ended up getting a really nice garlic pasta dish each and there was even wine available for those who wished. But paper napkins LOL It was wonderful food though! Crossroads with traffic lights, used by cars etc and the tram. The tram makes a right turn (or a left coming in the other direction) so was only using 2 of the 4 roads that converged here. Now, the tram travelled down the centre of the roads as the stations were on the median strips where people stood to wait for it, and of course get off, so when the tram was turning right it just went when the cars went on a green arrow but when the tram was turning left it would have to cut across all the cars going straight ahead so had to have a green left filter of its own. That’s part one of the tale; now for the buses turning right… Buses of course have to stop against the left-hand kerb to pick people up so as some of these approached the lights they need to turn right but have not had time to wait for 3 lanes of cars to go past (if that ever even happens!?) so they drive straight forward in the left-most lane to the far side of the lights and sit and wait for the lights to go amber and then red. As the lights turn red the buses turn across the now empty intersection and on their way, already in the left-hand lane for their next stop. David was beside himself with excitement LOL I’ll tell you what, it made a heap load of sense!!! Buses waiting in the intersection while cars go straight ahead past their right-hand sides. Lights have gone red and first bus commences its turn. Completing their manoever before the opposing lights turn green! And guess what? Yup, we went home and watched Tiger Woods followed by a manicure for me and then a lovely cool spa for us both.